‘I don’t like poems I can’t understand, and you won’t find any riddles in mine’ – so said the back cover of Pete’s first collection, It’s Your Dad, and he certainly started the way he means to go on. 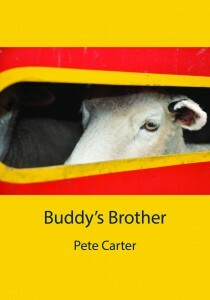 The poetry and prose in Buddy’s Brother is straight-up, in your face, and open-hearted, and covers Pete’s usual preoccupations: life and death, tennis and bad backs, dogs and walking. This time he writes of a beautiful but gruelling walk along the South West Coast Path in Britain — a walkway that’s as long as our North Island, and tells of cycling across India and down through New Zealand in a trip that eventually introduces him to his wife. As with his last book, Pete also spends time trying to get to grips with a dad, this time it’s not his own but his wife’s. He’s called Colin, and he’s Buddy’s Brother. Pete’s photographs have appeared in several publications, and are in corporate collections. He has had two solo exhibitions and participated in group shows in New Zealand and the United States. He lives in Eastbourne with his wife, Jacs, and has two grown-up children and two dogs.